Your projector is designed to be installed on a wall or ceiling (with the included mount). You can also place the projector on almost any flat surface (with the optional floor stand) to project an image in a portable setup, or on a lighting track (with the optional lighting track mount). 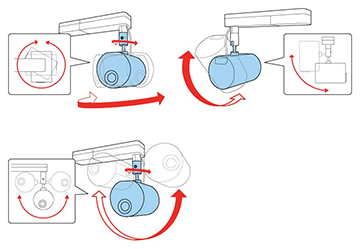 Follow the instructions in the Installation Guide to install the projector on a wall or ceiling. If installing on a lighting track, use only the optional lighting track mount (ELPMB54). 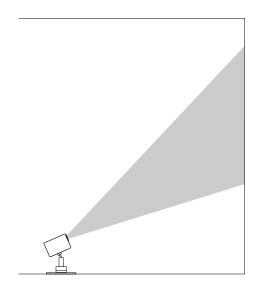 If the projector is not mounted, place it on a sturdy, level surface using the optional floor stand (ELPMB55). Leave plenty of space around and under the projector for ventilation, and do not place it on top of or next to anything that could block the vents. Position the projector within reach of a grounded electrical outlet or extension cord. Note: Use the direct mount (included) only for mounting the projector on a wall or ceiling. If installing on a lighting track, use only the optional lighting track mount (ELPMB54). 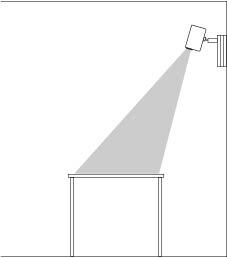 If you do not mount the projector, use only the optional floor stand (ELPMB55). Note: Be sure to leave at least the following amount of space around the projector to avoid blocking the air exhaust and intake vents. 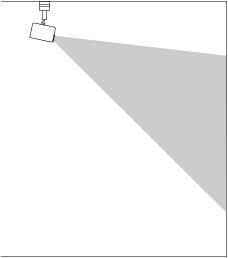 If you are installing multiple projectors next to each other, be sure to leave at least 20 inches (50 cm) of space between the projectors. 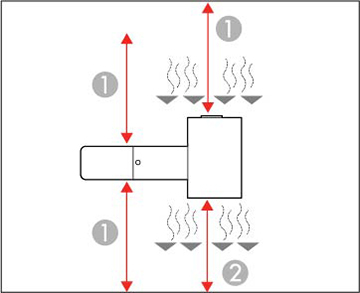 Also make sure heated air from an exhaust vent does not go into the air intake vent of another projector. You can rotate the projection unit 360 degrees horizontally and 90 degrees vertically. You can also tilt the image 90 degrees in either direction. Make sure to select the correct Projection setting in the Extended menu.